On the birthday of the German Victoria's Secret "angel", we recall all the most interesting things about her. She is included in the top 20 most popular models of the world. Participates in Dior and Rrada shows. She's friends with Naomi Campbell, Kendall Jenner, Doutzen Kroes and John Kortajarena. She dated Leonardo DiCaprio and is still friendly with him. At the same time she is sweet, smart and simple. And here are five facts proving this. Toni was always fond of sports. During the 2006 World Cup 2006, a blond girl with an ideal smile was noticed by Claudia Midolo, owner of the German model agency Modelwerk. Thanks to her, Garrn at the age of 15 worked with Calvin Klein, becoming the face of their advertising campaign. Later, the girl signed a contract with the New York agency Women Managemen. In the first year of her contract, Toni participated in more than 60 shows of famous fashion houses, she has more than 80 covers. That's what it means to love football. 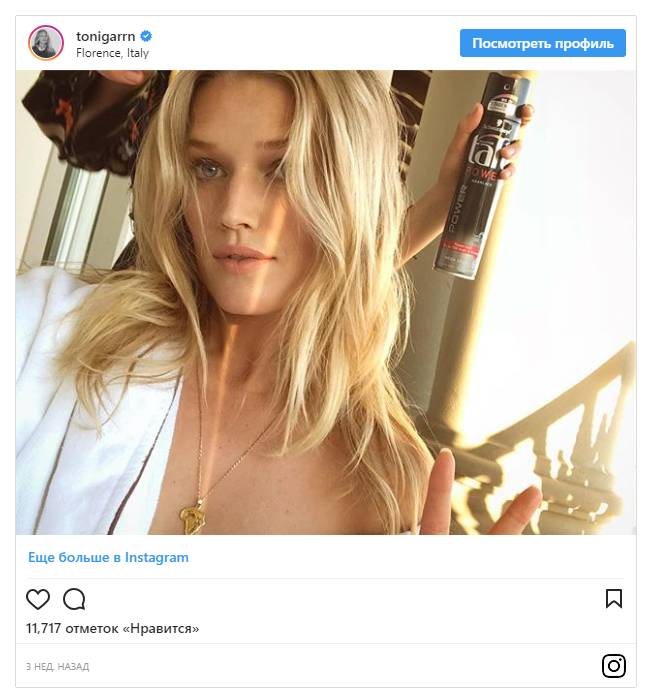 The model has more than one million followers. And she is ready to share with them all, except the details of her personal life. For example, she uploads cute videos of his parents and friends. Or shows the "underside" of her work. "I love social networks. And I do not like that models are perceived only as mannequins for clothes. Being a model is the same job as everyone else. And when you're on the podium, you show the result of this work. Social networks provide an opportunity to show themselves from different sides, to manifest as a person, to share their lives. " Toni was born into the family of an oilman and a businesswoman. Parents gave children a good classical education, including music. But Toni and her older brother Niklas became models. True, Toni at every opportunity tries to play Beethoven's sonata. "My dream is to have a piano in the lobby of every hotel," the model admitted in an interview. Toni does charity not because it has become fashionable. She always helped the needy. A few years ago she visited Africa. And she decided to visit the continent at every opportunity. 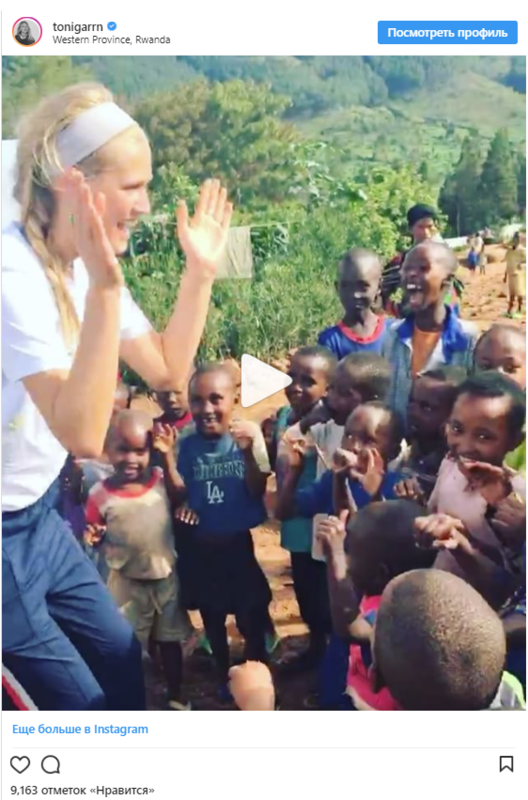 Supermodel really often flies to Africa, just look at her Instagram. Garrn even took custody of an African girl. And all the income from the sale of her own clothing line is sent to Africa. Toni always bypasses the topic of personal life in an interview. Journalists know about this and do not try to find out from the model her heart secrets. But still some information sometimes gets into the newspapers, as it was with a double date of DiCaprio, when after a meeting with a girl, he went to dinner with Garrn. "I'm not going anywhere. All these conversations get me. Sometimes I lie at home on my grandmother's sofa, but even my grandmother, after reading the newspaper, asks me: "Are you all right? And then they wrote ... "I dream about four kids. But I travel every day, I do not even have a houseplant, because I can not take care of it. And I understand that someday it will end and I will have to settle down. "